Chicken and Pea Treats- These treats use cage free chicken and are gluten free. I'm not sure my dogs care about either of those things but I like to be conscientious about what they eat. I've tried both grain free and regular foods and they don't seem to have any issues either way. PLAY Suitcase- Bugsy is the only one who will sit still for photos so I always have more photos of him. I have to sneak up on Dexter when he's asleep and he STILL seems to know I have my camera. /sigh. Bugsy loves to rip things apart to get to the squeakers. This suitcase toy took a little longer than normal because of it's material. Orbee Planet Dog- This is a rubbery, bouncy ball. Because of it's irregular shape it bounces all over the place and Bugsy LOVES it. This is the same brand as a Raspberry we received two years ago and he still loves and plays with that one, too. It might be our longest lasting toy. 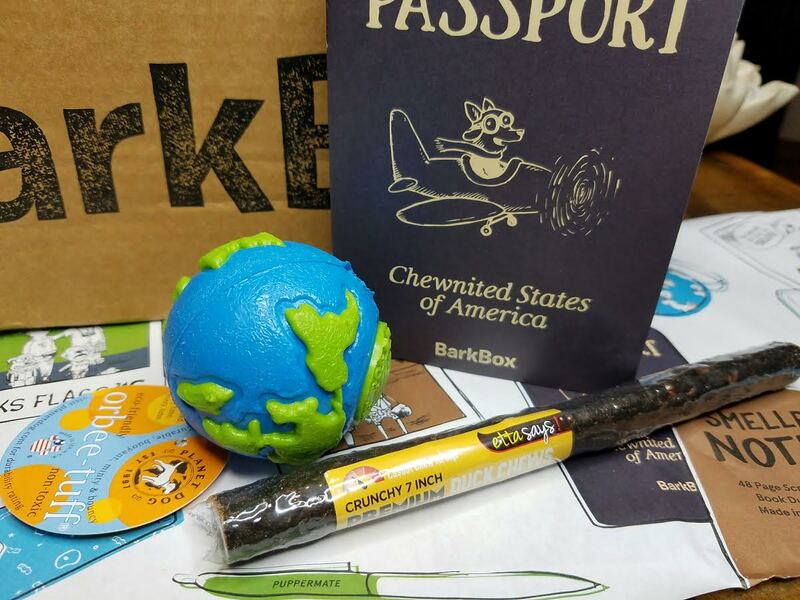 Etta Says Duck Chew- I noticed that Barkbox has revamped their website a little and now (instead of accessories) it says that every box will have a chew. I'd rather have chews than accessories but I'm not a fan of these Etta sticks. They're very crunchy and they make a mess. Crumbs get everywhere. Plus they're gone in record time. I wish they sent bully sticks! VERDICT: I love getting these boxes. Even at the monthly rate, I think they're worth it. I'd spend as much anyway and I wouldn't get such unique toys. The only flaws, I think, are that they don't have a Tiny Dog box (under 10lbs) and they charge an extra $5 to ship to Hawaii and Alaska. Otherwise, they've provided HOURS of entertainment month after month and I'm always stocked up on healthy treats. My dogs are pretty smart (rat terriers) so I feel like the constant rotation of toys is good for their brains. If you would like to sign up for Barkbox, you can get a free month added to your subscription with this link. No coded needed! I think these boxes are great for my small dogs. Do you have a bigger dog? 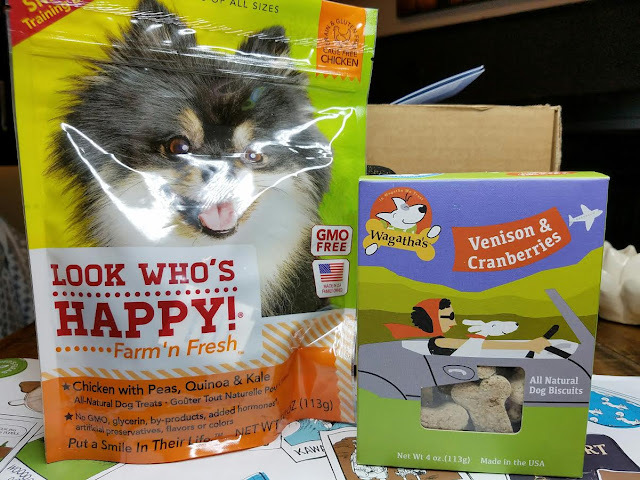 What's your experience with the toys and treats that come in the larger dog boxes? As a TOTAL side note (not even related to Barkbox but to dogs), I just bought this Woolly Snuffly Mat on Amazon for Dexter because he has been inhaling his food and choking on it. IT'S AMAZING!! If you have a dog like that, this works better than anything I've ever tried (fancy bowls, balls inside, strange shapes, etc). It's absolutely perfection. Both dogs have one now and they take ten minutes to eat and they have fun doing it! I just wanted to mention it because I know it's a common issue that dog parents struggle with. I can't even tell you how happy I am with it. I was getting so worried about Dexter and now the problem is completely solved. Buries her bowl!? Like outside?! That's hilarious! Dexter never cared about his food much until we got another dog (Bugsy), then suddenly eating became a competition. Haha! Thank you! I'm pretty partial to them. :) I've been working on it! For some reason Dexter is TERRIFIED of the box itself. He won't go near it except to sniff and run away! Bugsy wants to rip into everything and it's hard to keep him still enough to get non-blurry photos. However, I've started doing the whole "sit" "wait" training thing when the box arrives while giving treats for being good. It's working because now Bugsy will at least sit still for long enough. Howlooo Sarah! 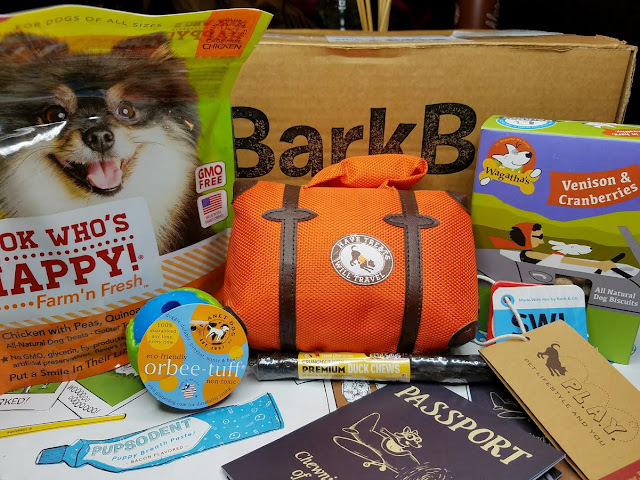 Thank you SO much for being a loyal pupstomer and reviewing our boxes! 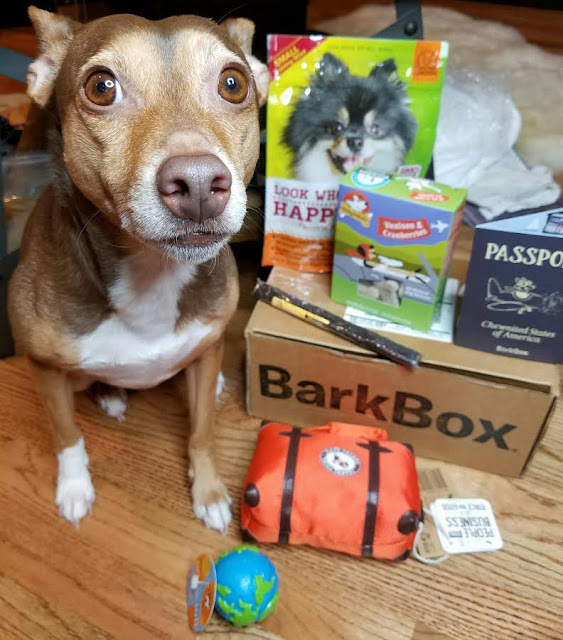 I am so sorry to hear that Dexter is terrified of the actual box, but ruv that they both enjoy the goodies inside :) I'm furry glad to hear that the Orbee Globe Ball is a hit too! 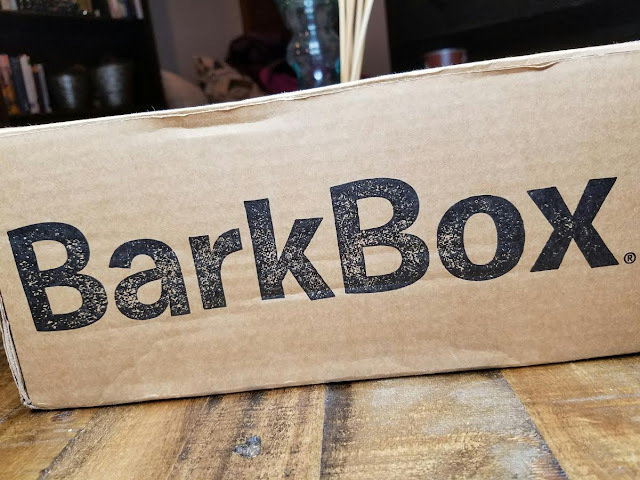 If you ever receive something that you don't want to give Dexter or Bugysy, OR if they don't like an item they retreive, bark at Lindz@BarkBox.com! We'd be happy to get a replacement sent out that both pups will ruv. 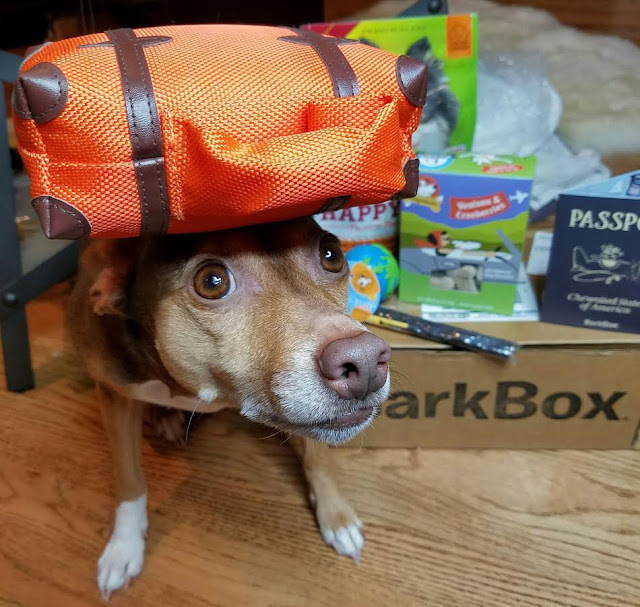 This is our Scout's Honor guarantee - we can replace an item per BarkBox! Thanks fur being in the pack, and give them extra belly rubs for us!